Tremaine Edmunds was a no-doubter for the first round of Thursday night’s draft. The dynamic former Virginia Tech linebacker who can rush off the edge or drop back in coverage was one of the most intriguing defensive prospects on the board. He was good enough to declare for the draft at 19 years old. When he dropped to 16, the Buffalo Bills swooped up to take him. His brother, former Virginia Tech safety Terrell Edmunds, was a long shot. He’s a fine safety, but with elite playmakers like Minkah Fitzpatrick and Derwin James ahead of him, he looked like a later-round pick. But Pittsburgh parted with starting safety Mike Mitchell in the offseason, and when it came their time to select at No. 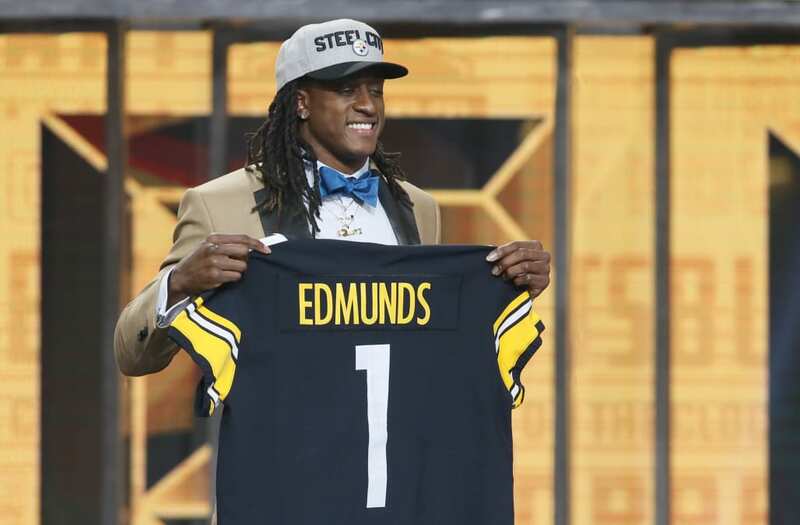 29 on Thursday, the Steelers decided Edmunds was their guy. The pick made history as the Edmunds brothers became the first pair of brothers to be selected in the first round of an NFL draft. It was a moment that even Terrell didn’t seem to expect. Terrell Edmunds was in the bathroom when he got the call from the Steelers, He said he ran out of the restroom with his belt unbuckled and his pants unzipped, frantically trying to get himself together for his big moment. Other brothers have been taken in the same draft, like Ronde and Tiki Barber (1997), Shawn and Stacy Andrews (2004) and David and Chris Carter (2011). But never have two walked out of the same draft with both looking at making first-round money. The Edmunds won’t be the first two from their family to play in the NFL. In fact, they project to be the second and third Edmunds in the NFL next season, joining their brother Trey Edmunds, who saw limited action as a rookie running back and kick returner with the New Orleans Saints last year. Their father Ferrell Edmunds was a two-time Pro Bowl tight end in the NFL. It looks like they’ve achieved that blessing and exceeded expectations while doing so. • Did Cardinals get NFL draft’s best QB with 10th pick?